For several hundred years, local and national legislation has attempted to balance the constitutional right to carry guns with the requirement that gun owners use them lawfully. This balance is struck through background checks processed via the FBI’s National Instant Criminal Background Check System (NICS). Your Local Security (YLS) looked at the evolution of the background check’s role in purchasing firearms, and our analysis of NICS data—taken from the American Community Survey’s 2017 one-year estimates—uncovered some interesting facts about gun-buying patterns across the country. 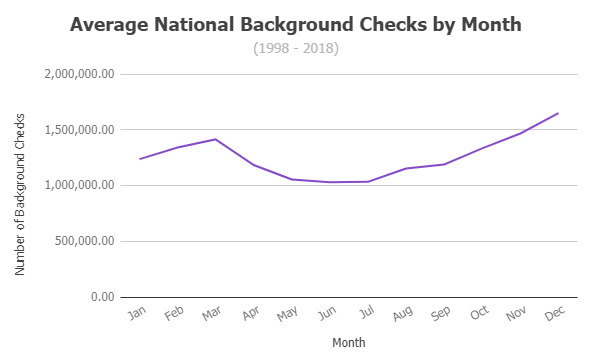 The total number of background checks has risen steadily for nearly the past 20 years (though there was a slight decrease in 2017). In 2018, Federal Firearms License (FFL) dealers initiated more than 23 million background checks, with significant variations in how many requests came in from each state. As you can see on the map above, Kentucky generated far more than any other state—4,508,298 to be exact. That’s not necessarily because more gun owners reside in the Bluegrass State than elsewhere in the country. 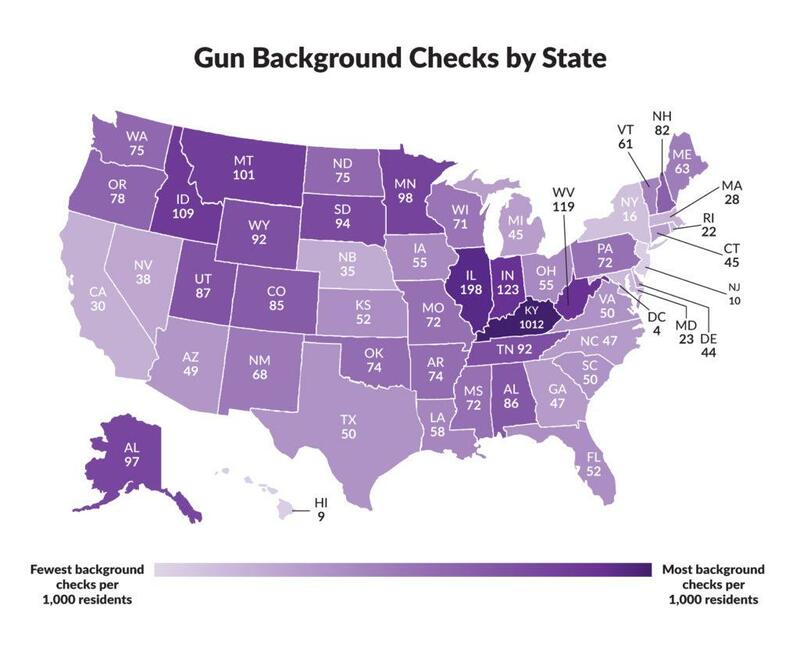 Rather, Kentucky has more background checks per capita because it is the only state that requires every holder of concealed carry permits to undergo automatic monthly rechecks. 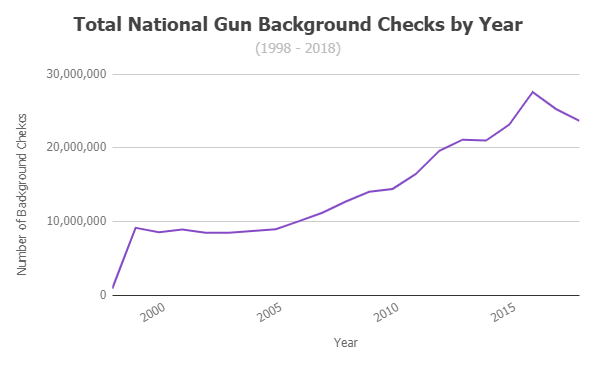 YLS also found some clear trends in the days, weeks, and months with the highest number of background checks over the past two decades. December is one of the busiest months, with four of the top ten weeks falling in the last month of the year. And while we can’t say for sure that it’s due to post-Thanksgiving sales, six of the top ten days have occurred on a Black Friday—and November 24, 2017 had the highest number of background checks on any single day. In the last 20 years, 0.53% of the 302,069,735 total background checks submitted were denied, most commonly when the applicant was convicted of a crime punishable by more than one year or a misdemeanor punishable by more than two years in prison. Distant second and third reasons for denial were applicants who were fugitives from justice or unlawful users of a controlled substance. The fewest denials—101, to be exact—were for individuals who renounced their US citizenship. The Constitution’s enactment gave every US citizen the right to carry a gun, but it would be 143 years before any federal laws regulated the ownership and use of firearms. On the local level in the late 1800s, however, city leaders seeking stable, family-friendly communities enacted ordinances limiting the carrying of guns on the street. Many of the most notorious towns of the Wild West—like Tombstone, AZ; Deadwood, SD; Abilene, TX; and Dodge City, KS—required visitors to leave their guns with the sheriff (or check them in at a hotel, like a coat-check system). The Southern states were among the first to enact laws prohibiting the carrying of concealed weapons (guns and knives) in the early 1800s. Legislation around firearms shifted to the national level after the public became concerned with the increasingly cozy relationships between gangs and local government in big cities like Chicago. For example, the St. Valentine’s Day Massacre in 1929 was seen by many as “the culmination of the use of criminals by politicians and of politicians by criminals. This mutuality of service and profit made twins of politics and crime,” according to A. Brad Schwartz in The New York Times. Five years later, President Franklin D. Roosevelt took dead aim at Tommy Gun–toting gang members with the National Firearms Act (NFA) of 1934, the first federal gun control law in history. The NFA levied a steep tax ($200) on the manufacture or sale of machine guns and sawed-off shotguns, effectively removing those weapons from private ownership. The Federal Firearms Act of 1938 went even further in defining who could own a gun by making it illegal to transfer ownership of firearms to “certain classes of persons,” including felons. While there were prohibitions in place as to who could buy a gun, there was no way for FFL dealers to know if someone was on the “do not sell” list—at least, not until the passage of the Brady Handgun Violence Prevention Act in 1993. The Brady Bill was spurred by the assassination attempt on President Ronald Reagan by John Hinckley, Jr., and was named after White House press secretary James Brady, who was paralyzed in the attack. The legislation instituted mandatory background checks via the NICS system, as well as a five-day waiting period before a gun could be legally transferred to a new, qualified owner. First, federal law requires buyers to provide a photo ID and ATF Form 4473 (the Firearms Transaction Record) to the FFL, who then contacts the NICS for the background check. On average, results from the NICS come back quickly. In 2015, the wait and processing time to an NICS call center averaged 446.3 seconds. An online NICS E-Check was even faster, at an average of 107.5 seconds of wait and processing time. Clean background checks mean that the transfer of the firearm can proceed immediately. 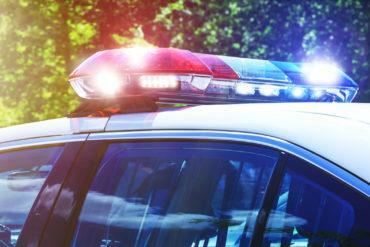 If the initial check brings up incomplete data, the transaction will be delayed and the NICS has three business days to conduct additional research with local, state, and federal law enforcement agencies. If the NICS is unable to either approve or deny the application by the end of that time period, applicants can appeal. In addition, a denial may be issued if the prospective buyer has a similar name or similar descriptive features as someone who falls into one of the above categories. Although the process of buying a gun is pretty much the same no matter where you live, there are variations in waiting periods and other aspects of state law around firearm ownership. And whether or not you choose to purchase a gun for protection, there are a variety of home security packages available that can help keep your home safe and secure. About YourLocalSecurity.com: YourLocalSecurity.com—an ADT Authorized Premier Provider—aims to provide the security tools and information needed to build a safer home environment. Your media contact for this report is Alec Sears (alec@yourlocalsecurity.com). Email for interview requests, exclusive quotes, or questions.